When most children enter foster care, they receive two trash bags to hold all their belongings. Sweet Cases for Sweet Faces is an Omaha based community fundraiser that has partnered with “Together We Rise” a 501(c)3 organization dedicated to improving that situation through what they call “Sweet Cases.” A Sweet Case is a duffel bag with a hygiene kit, blanket, teddy bear, coloring book and crayons. Each bag cost $25 to build and 100% of the money raised stays right here in Omaha. 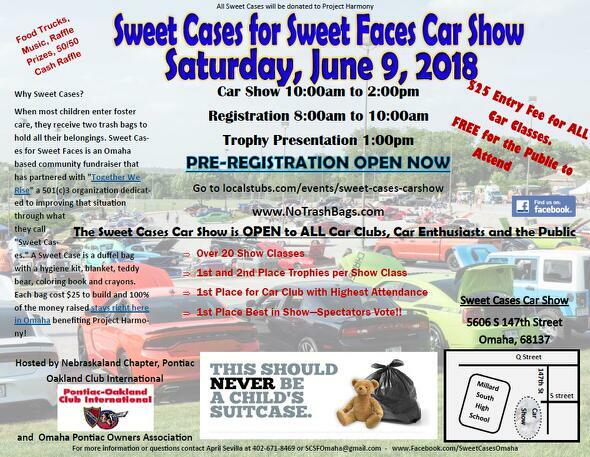 Come out on Saturday, June 9th from 8am to 2pm for a day filled with Beautiful Cars, Great People, Terrific Food, Music, Raffle Prizes, Face Painting and Balloon Twisting for the kiddos and Help Support an Amazing Fundraiser. FREE EVENT FOR THE PUBLIC TO ATTEND. NO ADMISSION CHARGES. $25 Registration for cars/motorcycles/pedal cars entering the car show. 1st and 2nd Place Trophy given per Show Class. Can’t wait to see you all there!!! !